For BluProjects standing out in the denim industry has been a lot about its passion for cleaner denim production. And that passion, coupled with a collaborative approach to fixing what’s broken in the denim-making process, plus a dedication to design and value added product, have made BluProjects a force in the sector. The Turkey-based consulting firm is driven by creating solutions for making the denim industry more responsible, making sure companies take ownership of their harmful practices and offering viable solutions to fix them. The firm has made it a mission to stress the importance of sustainability and responsible fashion as means to a cleaner tomorrow. The big fix for the industry, according to BluProjects, can only be achieved through creative collaboration between like-minded companies and individuals who realize that producing better is much more important than producing more. 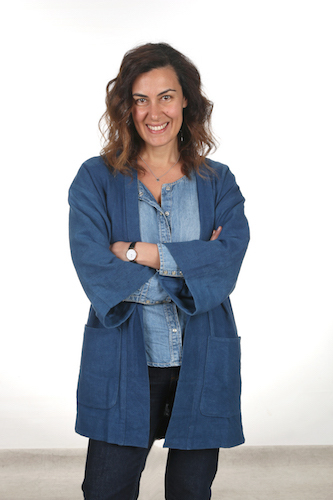 Carved in Blue caught up with BluProjects’ Sinem Celik to learn about the company’s mission to improve the denim supply chain, giving denim “leftovers” a second life, and why a favorite pair of jeans is like a best friend. Carved in Blue: Can you tell us a bit about BluProjects mission? Sinem: Being in the denim world for years, I have witnessed the transformation of the industry, from design and quality driven times to the fast fashion–dominated era. All those years working in the middle of the sourcing chain has given me the chance to understand what exactly the brands need, what the market is missing and ideas on improving the supply chain. We all know that there is a rising need for the real value of the product among all the massive overproduction and awareness of responsible fashion. The sustainability term is mostly being used like a new concept, rather than a mind-set, sometimes without even having real content. The market is in need of realness and sincerity. I wanted to contribute with this particular focus, so I have designed my own platform. The mission of BluProjects is to develop sustainability projects catering to the brands and sourcing companies, with a dedication to the value-added product, and to design new models for mindful sourcing. Creating bridges and connecting like-minded people are the key steps during this journey. Having this framed setup, I feel myself very satisfied both to be a part of the solution and also to lead my efforts toward selling better, instead of selling more. That’s why I was named as creative sales development. I believe in collective creation. This platform also allows me to work with a collaborative approach, which I enjoy a lot. Carved in Blue: What is BluProjects going to tackle first? Sinem: We all know the impact of denim production to the environment and how alarming the situation is. Thanks to the new technologies it is possible to create more durable and responsibly produced jeans. My consultancy projects serve for companies with a dedication to design and sustainability. I am helping my customers to spread the value and to introduce these innovations, combined with the best aesthetics, to the global brands. One of the projects that I am currently working on is a special garment-washing innovation, where we are proud to see significant savings. It is nice to see the same excitement from the market as well. Carved in Blue: Why is sustainability important to you? Sinem: As a person I care a lot about the environment. And I am a real nature lover. If we slow down and look around, nature is full of inspiration. Remembering that the earth has always been a giving planet, and whatever humans need is provided by the natural world around us. It has its own cycle to be able to sustain giving, but we humans show no respect to protect this natural flow. Working in an industry that has such a huge impact on the environment made me think about directing my efforts to responsible fashion instead of a massive number-driven industry. I want to do my part knowing that even small steps matter. I define sustainability not only with the production improvements. Designing timeless products and supporting less consumption are also key elements. Carved in Blue: What do you think has been the greatest innovation for sustainable denim? Sinem: I believe the greatest thing is the way the industry shows a collaborative mind-set and collective development approach. Conscious yarns combined with cleaner indigo dyeing processes, with final touches of sustainable garment washing technologies are all essential and all equally important. They are all supporting each other. Carved in Blue: What do you love most about denim? Sinem: I love the uniqueness of denim, the fact that it stays in our memories and tells stories because it lives and ages with us in time. Looking at my favorite pair of jeans, which I am wearing now, I feel like it’s my best friend, as we’ve been together through all the journey. There is no other fashion item that is considered to be timeless, and is also a way of self-expression. The indigo itself has always amazed me, too, full of surprises, like real magic. Carved in Blue: What’s missing from the denim industry today? Sinem: I think we all need to remember the real value of denim and revisit the history of it. What makes it so special was the durability and it aging beautifully with time. Due to the “sell more, consume more” chaos, unfortunately margin overtook design and quality as fashion got faster. As the industry is oversaturated with sourcing options, sincerity also becomes very important to differentiate the value. It’s worrying to observe the lack of respect to the product and design. But I hope there is a new transformation coming. Carved in Blue: What’s next for BluProjects? Sinem: Trying to think in a circular model, I am aiming to touch different parts of the industry. Knowing Turkey is a key country in the sourcing chain, I have decided to play a role in education too. I am a lecturer at Istanbul Fashion Academy, where I have initiated and designed a new course about sustainable denim and mindful sourcing. We will be trying to raise awareness to the industry with the younger generation and to help them focus on value-added products from the very beginning. Another fact is that there are so many leftovers in jeans wear production. I am designing creative ways to help those leftovers live their second life. I am currently consulting for a brand, where our next step is a special up-cycling project. I am supporting a local slow fashion brand, as a volunteer. I want to introduce this artisan value to the global denim lovers. We have exciting projects for the upcoming Denim Days festival. Sinem: It shows a great passion to this blue world, and a dedication toward a better industry. I appreciate your efforts to spread valuable business models and innovations to a wider audience. 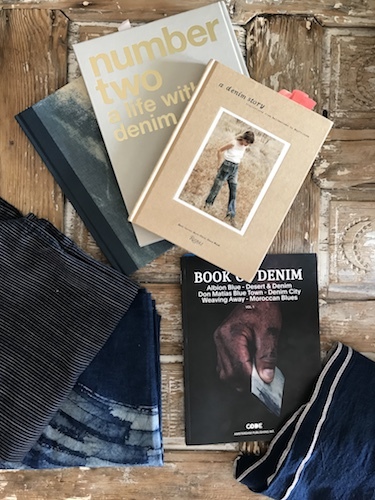 Carved in Blue has become a platform where denim network connects to each other and creates collaborative work. Living in the digital age, such a trustworthy channel of reaching to information is very helpful for the industry.